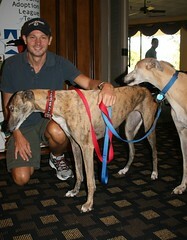 Over 50 golfers descended on Canyon Creek Country Club on September 24th to play in GALT's first Greyt Golf Tournament. 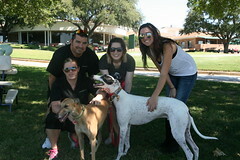 The weather was perfect and several of GALT's greys came out to greet the golfers and show their appreciation for the funds raised to help defray GALT's medical and boarding costs. In addition to a fun day of golf, the participants were treated to lunch, dinner and valuable goody bag items. We had some fabulous live auction and raffle prizes, which helped to raise even more funds for the hounds. Many thanks to our donors, volunteers and celebrity guests - Mark Followill, Brady Tinker, NFL great Tim Brown and The Ticket's Mike Sirois. 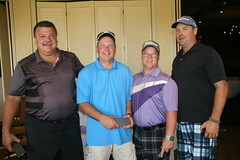 Brady, Tim and Mike joined Ron Christian and Eric Lendl on the winning team with a blistering score of 58. 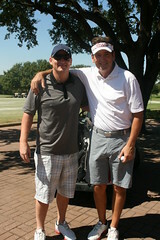 The second place team lost out on first place in a very close score-card playoff. Members of that team were David Hindman, Cary Smith, Allan Hanes and Ralph Shelton. put up quite a fight! Penny & Sheldon loved the Massage Chair crew! 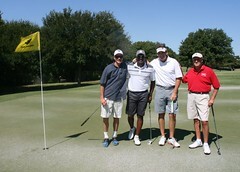 Thanks again to all who helped make our first golf event such a success!